I'm not sure I enjoy camping in rainforests. I was up in south-east Queensland a few weeks back and we were heading for a camp marked on the map that I’d never been to before. We arrived late. The sun had already set and, in the gloom of the rainforest we were travelling through, it was now dark. In the headlights, the camping area looked uninviting, rank and mouldy. Sadly, we had little alternative; we dragged out our swags and threw them down for the night. My first camping experience in a real rainforest was down in Tassie when we had been rafting the Franklin River for a week or so. On that occasion, we reached the Gordon River and pulled up for the night, camping just up off the bank in what was deep, dark and dense rainforest. It was so dark during the middle of the night that when I got up to go for a twinkle I couldn't see a thing. By then, I had also realised I had left my pack, containing my torch, on the other side of what had seemed, during daylight hours, a pretty innocuous stream. Stumbling around in the dark, I crashed into a tree and went bum up into the creek. Following much swearing and floundering, I found my pack and torch, and went off for the aforementioned twinkle. My next experiences were in the jungles of Malaysia during the incredible offroad event, the Rainforest Challenge. I had been pre-warned, “Get a stretcher to sleep on... and make it a high one!” When I asked why, I was told the mud could be so thick and deep that a short legged stretcher would have you lying on top of the mudpack – if not within it! Great, I thought – although I was so knackered at the end of those days in Malaysia that sleep managed to defeat my fears of sinking into the mud, despite the sky-high humidity and torrential rain. We woke most mornings to more rain and mud so deep you could lose your boots in it. Away from the rough and muddy tracks that were proving such a challenge for the vehicles and the drivers, you only had to walk a few metres into the scrub and you were surrounded by a sea of green. Actually, ‘sea’ is the wrong word – ‘shroud’ is more like it! 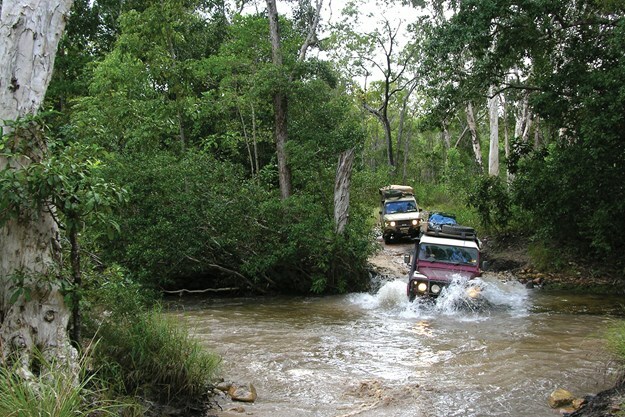 My next few journeys into the rainforest came while camping at Cooks Hut in the Iron Range NP, Cape York. Our second occasion there was particularly memorable; we tried to cook on an open fire as the rain pelted down. When the rain finally relented, the humidity was so high you felt as if you were in a sauna. Sleep didn’t come easy that night. In 2012 we spent a month in New Guinea, mostly searching for WW2 American MIAs in the forest and amongst the tall kunai grass. Again, the heat and the humidity were stifling. Luckily for us, we spent our nights back at a couple of base camps we had established in native villages. The one on the beach on the country’s north coast was a beauty, the sea an added pleasure – allowing us to wash and cool off after a day of looking for old and overgrown crashed aircraft. Full circle now to my latest foray. I awoke in the morning to the muted light of the rainforest, packed and got underway fairly quickly, feeling like mould was already starting to take root on my sleeping bag and clothes. That evening we were camped just off the beach on Stradbroke Island and the feeling was completely different. I wasn't being smothered by greenery, suffocated by humidity or drowned by rain. I could see more than a few metres, a breeze wafted through the coastal she-oaks and I was again happy with the world. Yep, I had found my nirvana... or is it out in the desert country? One place it isn't, I'm sure, is in a bloody rainforest!